Every Singaporean is a foodie. Fortunately for travelers, this means that you can eat very well in the country without spending a lot of money. And while Singapore has plenty of fine dining options, it's primarily cheap hawker food that I miss when I'm back in the US . We've already covered duck rice, popiah, Ipoh hor fun, fish head curry, chilli crab, fish ball noodles, and Hainanese chicken rice, so to continue our series on Singaporean regional cuisine, here's another dish that serves as comfort food to me. The Chinese love our broth soups. 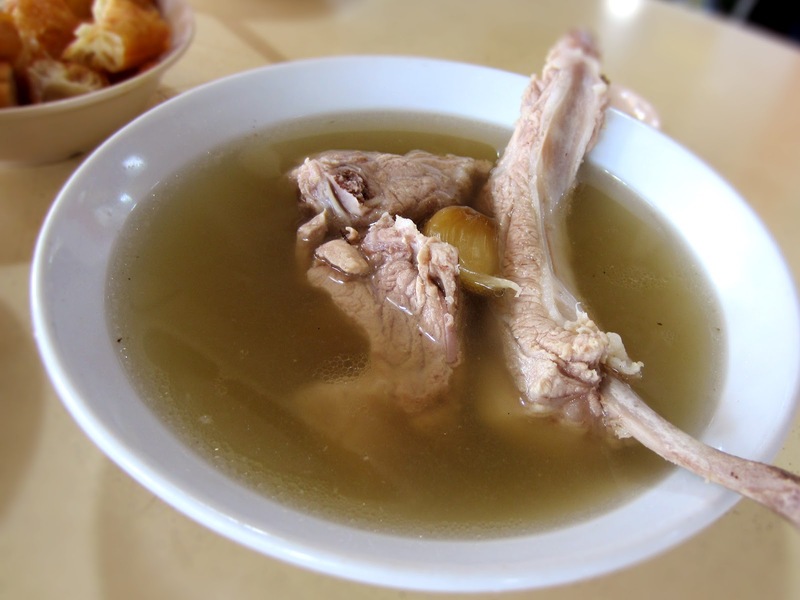 Bak kut teh, which translates literally to "meat bone tea," is a deceptively simple pork rib soup in a peppery broth created from star anise, garlic, cinnamon, and cloves. Brought to Malaya by migrant workers from China, the story goes that the coolies could not afford meat and brewed pork bones into soup because it was cheaper. Depending on who you ask, the coolies were either Teochew or Hokkien (Fujian). What is clear is that different Chinese groups developed their own versions of bak kut teh, from the increased pepper in the Teochew style (the most popular in Singapore) to the highly herbal Cantonese style. In Singapore, you'll usually get rice and yau char kwai (fried dough) with your bak kut teh, and don't hold back on drinking as much soup as you can handle - stalls are quite happy to refill your bowl with hot broth for free.